A man stole $8000 from a 7/11 in Ridge. Ridge, NY - June 23, 2014 - Suffolk County Crime Stoppers and Suffolk County Police Seventh Squad detectives are seeking the public’s help to identify and locate the man who stole money from a Ridge convenience store last month. A man entered 7-Eleven, located at 1670 Middle Country Road, on May 31, 2014 at approximately 1:30 p.m. and stole more than $8,000 from the store manager’s office. The man was described as black, 35 to 40 years old, between 5 foot 8 and 5 foot 10 inches tall with a stocky build. The man was wearing a Polo Ralph Lauren hat and a Polo Ralph Lauren shirt with a tie. He was wearing dark-rimmed glasses and had a Bluetooth device in his right ear. 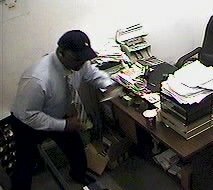 Subject: LongIsland.com - Your Name sent you Article details of "SCPD: Man Wanted for Grand Larceny in Ridge"